Looking for a 105mm Micro AI-S, but how will it work on a digital body (D60)? Discussion in 'Lens Lust' started by joelq, Jul 29, 2009. I've googled and read so many articles on the topic of using 35mm lenses on digital bodies, and the effects on focal length, etc. I think I get it , but have this additional question. Background: I'm looking for a 105mm Micro AI-S (35mm) for my D60. The lens will be used pretty much exclusively for shooting 1:1 closeups of corals in my reef tank. I've zeroed in on the 105mm because it gives me great working distance for taking shots of pretty much anything in my tank (the tank is 18" front to back). I've also zeroed in on the AI-S version as I prefer to manually focus these types of shots anyway, and I'd just be wasting $ on an AF-S version. - Will the 105mm focal length change by the normal ~1.5x due to the smaller sensor on the D60? - Does this mean the lens will effectively be a ~158mm? - If so, should I just look for a 55mm Micro AI-S as it will be effectively closer to the 105mm I'm looking for? - Will this have an effect on the magnification of the shots? Will I still be getting 1:1 magnification with this setup? Thanks, everyone. I think my head's about to explode. You can use it in M mode, but it won't autofocus or meter. To figure the "effective mm", I think it's easier to realise that 35mm is the new 'normal' so, if the 105mm lens was a 2x magnification before, now 70mm is a 2x magnification so 105 would be about a 1.5x magnification so, yes - that's about equivalient to a 158mm lens on a 35mm film camera. I have a couple fully manual "film lenses", in fact, that's the majority of what I shoot with...figuring it this way just seems easier to me. The 55mm lens you mentioned would be about a 1.5 magnification or roughly equivalent to a 75mm lens on a 35mm film camera. If you want to just run up to Lancaster, PA, I'll let you borrow my 35-140 Soligar lens w/Macro to play with it Seriously, maybe somebody in the area would let you borrow one. As for the macro stuff....macro should work just fine. I do almost no macro so I can't report on the 1:1 question. The 105 AIS is excellent lens. I used my copy on a D2H for a couple of years and made some very nice captures. If you go this route look into grabbing some PK tubes 11-12-13 as they are very handy when using them on Nikkor AIS glass. Yes you will have to chimp for exposer but after you get everything set up it's easy to know where your at , exposer light focus wise. You havnt mentioned how you will light the subjects in the tank. Iv seen some example of fish and coral with lit multiple flash(slaves) with the flashes mounted on either side and one on the top that looked like they where taken in the ocean. Very cool. Thanks, everyone. Really appreciate the quick responses! @User - understood. I was planning to go full manual shooting, so no worries there. @jerryshenk - what a great rule-of-thumb! Thanks for sharing. And thanks for confirming the 158mm effective focal length of the lens. I guess I'm wondering if I'd get sharper/better quality shots with a 55mm micro (effectively 82mm) since I'm not riding the optics too much to get the magnification. Taking pictures of corals, I have the flexibility of getting up close without needing such a long working distance. @Nikkor AIS - I don't mind chimping at all, and in fact, was already planning to do it. Lighting-wise, I haven't really thought much about it, to be honest. I was planning to take shots with no flash as the lights needed to support hard corals provide more than enough light, but I hear you though - I could probably get some really nice effects with supplemental lighting like that! Someone can correct me if I'm wrong, but as I understand it, the 1.5x "effective focal length" factor only affects angle of view, not true focal length. It also doesn't affect DOF, nor does it affect minimum focusing distance. If you're looking to get 1:1 shots and the 105mm you're looking at has a focusing distance at 1:1 that works for you, using a 55 would require a closer focusing distance to get 1:1, which may be too close (if it would require you to have the lens underwater!). I just did a simple test with my Nikon 50mm 1.2 lens and with the focus ring set at 2 feet, it was in focus at about 2 feet...seemed off by about an inch but basically right. Thanks, everyone, for your replies! I went to a local used photo supplies shop just to see what they had in the way of macros, and they happened to have a non-AI, as well as an AI 55m micro. They also had an AI 105mm F4 micro. I brought my camera along to test them out. Well, I ended up leaving the store with the 105mm F4. Minimum focusing distance (very scientifically tested with a tape measure, and with the lens at it's nearest focus ) was around 10-11" on my D60. The 55mm minimum focusing distance was around 4" (if I remember correctly). I ended up getting the 105mm because of the more comfortable working distance. The shop's price was $275 for a very well-preserved lens, which compares favorably with the prices on KEH, especially considering I get instant gratification with this one. It's a bit late, but you do realise you could also have gone for one of the 105 NON-AI lenses that are always cheaper on Ebay than AI/AI-s versions with your D60, right? I did . And KEH actually had one last night, but apparently got sold as I couldn't find it again this morning. I also did a search on Ebay and could only find one non-AI model, and it was listed for $279 Buy-it-now, so I figured the "retail" price for the AI model I found was fair. Just wanted to post pics from my first batch of photos with this lens, in case you're curious. All these photos have not been modified except for setting the proper color temperature and cropping (where stated). 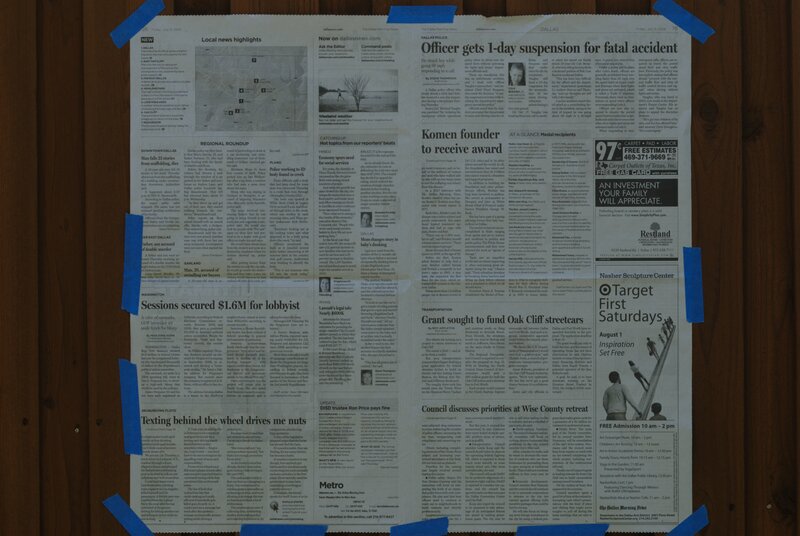 First, the newspaper test (although I'm not really sure how to properly do one - I just took a picture of a newspaper ), which I didn't realize after taking probably could have been focused a bit better, but I think the photo shows how consistent the sharpness still is from edge to edge, especially for a lens that's almost 30 yrs old! Also, in case you're curious, the camera was ~160" away in the pic below. Next, a minimum focus distance pic. I was curious what the minimum focus distance would be, especially for a 35mm lens mounted on a D60. The pic was taken with the lens at its closest focus, and the front end of the camera at the tip of the tape measure. Minimum focus distance is right at 9". Next, some pics of critters in the backyard. And finally pics of what I got the lens for - to take macros of corals and such in my reef tank. Overall - I'm very happy with the lens! Focusing is a bit tricky, and I found myself having to take several pictures, tweaking the focus in between, and even with that, ended up with some photos where the focus was still off. For example, the pic of the fly - I was trying to get his eyes in focus, but the best I could get was the (nasty) hairs on his back before he flew off. This is were a zoomable live preview would be really helpful!